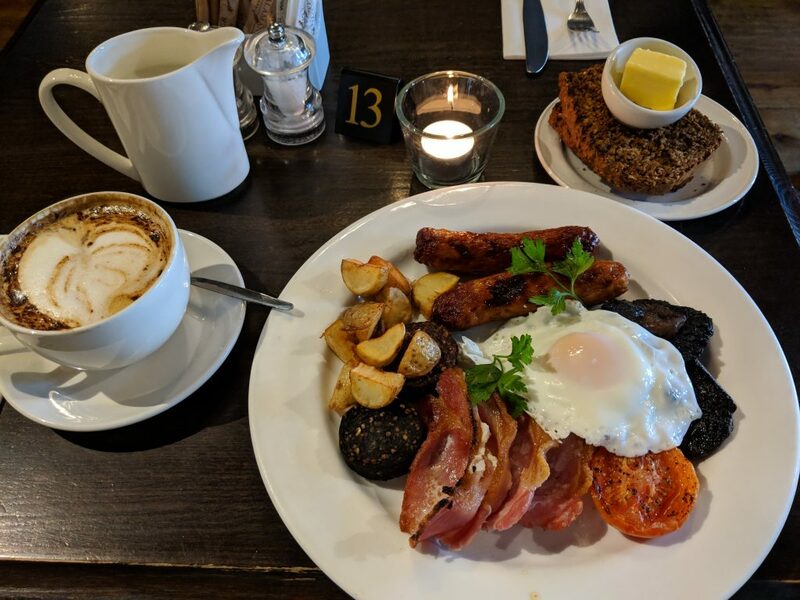 While this has nothing to do with the 1014 Battle of Clontarf, the battle of the brunch in Clontarf is a game of: where shall we have brunch today? If you are planning a visit to this coastal suburb of Dublin, these are the top three recommended places to go. In the 19th century Clontarf was a popular holiday resort, famous for its baths and seafront. While the area remained the playground of the rich and famous for most of the century, from the 1900s onwards it became an integral part of Dublin. Dracula’s author Bram Stoker was born in Clontarf in 1847. And now, let’s talk about the Battle of the Brunch in Clontarf. Forget about getting a table in the rooftop terrace overlooking the seafront during the summer, unless you book well in advance. I chanced my way into brunch one bright and crisp October morning, and I was rewarded with my own personal al fresco space at award-winning The Yacht Bar because no one else wanted to brave the weather. Even a waitress asked me if I had turned into an ice cube, and I was pleased to report I hadn’t. I guess my Italian blood has been tempered over the years to withstand Nordic temperatures. For a cosier option, The Upper Deck is warm and elegant, with opulent dark wood and chandeliers, perfect for romantic meals. Its menu is different from the main restaurant, with plenty of fish dishes. 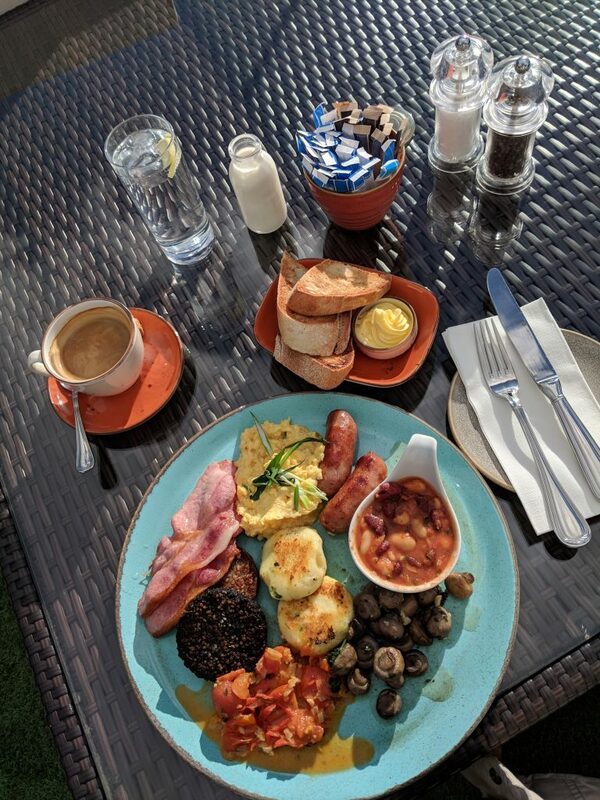 The full Irish breakfast at The Upper Deck, called the ‘Full On’ Grill, is an exaltation of local food that will likely induce a food coma, or at least that’s what happened to me. Brunch is only available on Saturday and Sunday, and the restaurant only opens for dinner from Thursday to Sunday. The main bar and restaurant downstairs is open Monday to Sunday for lunch and dinner. Brunch is a slightly pricey affair however the portions are extremely generous, from the creamed tomatoes and home made baked beans to the Clonakilty white and black pudding, both of which felt meaty and were packed with flavour (although I did prefer the taste of the black pudding over the white pudding). Clonakilty black pudding is made with beef, which makes it different from the traditional pork version. The white pudding is made with pork, oatmeal, onion and spices. The sausages were also meaty with a firm texture reminiscent of German bratwurst, which for me means extra points for a restaurant. The potato cakes gave me a false sense of security, looking innocently small but they were very filling, so I decided not to finish them and savoured the rest of the breakfast instead. Tiny button mushrooms delivered on garlicky flavour and the scrambled egg was fluffy but firm. The sourdough toast was nice enough but I couldn’t finish it as food coma was settling in. If I may make a small suggestion, I would recommend taking the butter out of the fridge a bit earlier and serve it at room temperature. Although this was the most expensive brunch out of the three venues I visited, I still consider this breakfast to be the best value for money because you do get a copious amount of food. I always judge brunches on how good the coffee is. 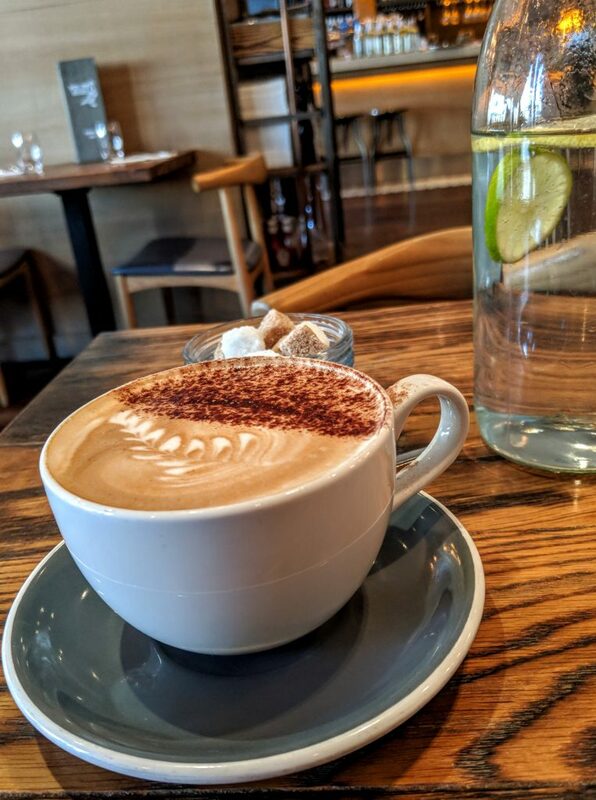 I know coffee has nothing to do with the meal but it would be a shame to be served a watery hot beverage alongside amazing food. I was delighted to see that The Yacht Bar uses Lavazza coffee. Brunch is taken seriously at Moloughney’s, as on a Bank Holiday Monday there was no room to swing the literal cat in. To stand a better chance to get a seat, I went the day after a Bank Holiday and thankfully only one table was reserved. One of the perks of being a freelance writer is being able to have a mid-morning coffee break or brunch. 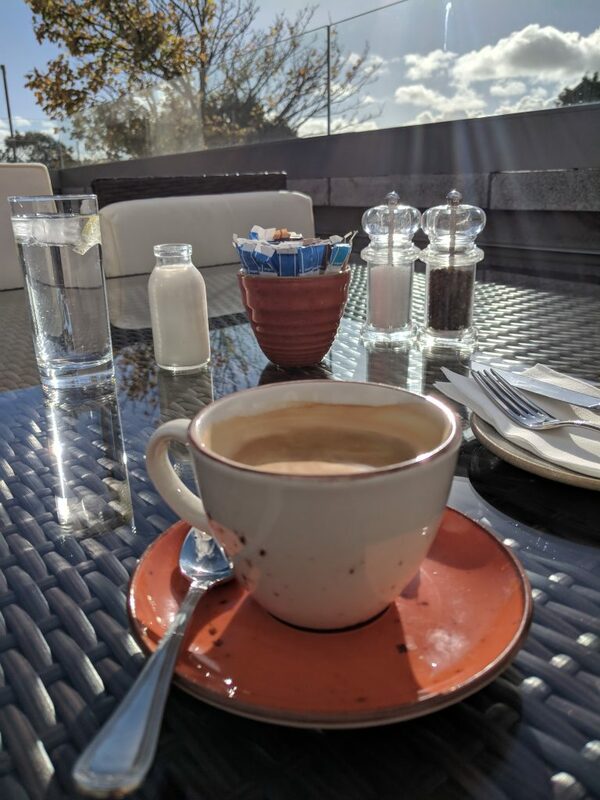 Although my initial plan was only to have coffee, I quickly realised that having brunch would be the perfect opportunity to write a review and contemplate on what Clontarf has to offer. 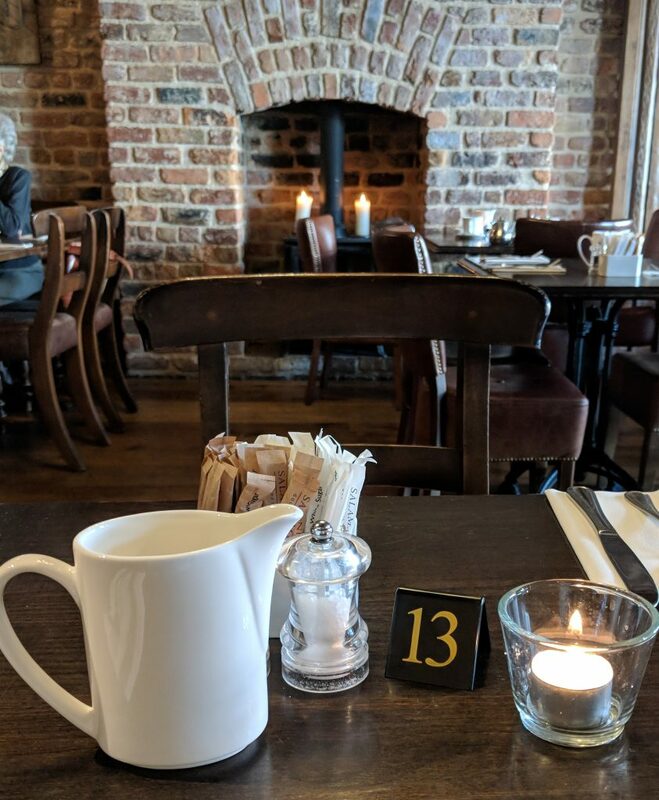 The atmosphere is relaxing and welcoming, and when I spoke to a local I was told that that’s one of the main reasons to go there for leisurely dining. Moloughney’s are proud to offer local Irish food (all the suppliers are listed on the website) and they know how to cook it. 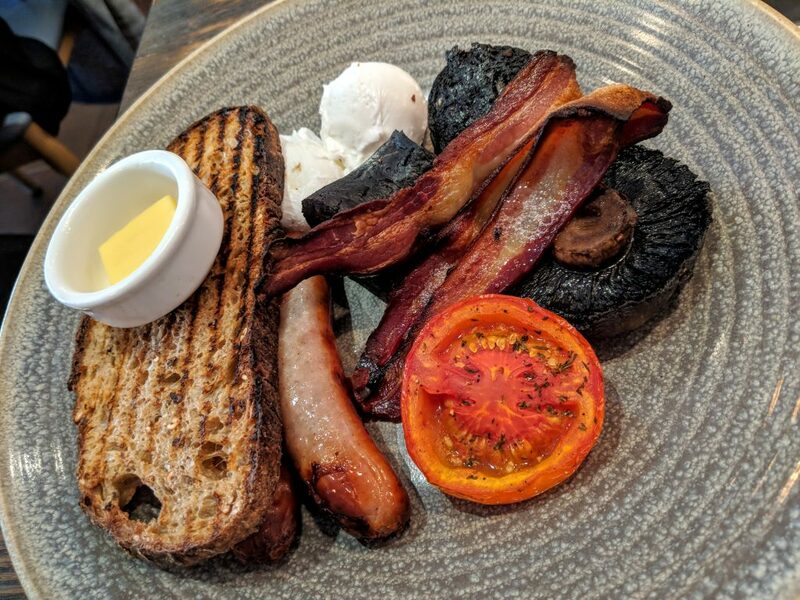 The Large Irish Breakfast came with small and dainty slices of Tournafulla black and white pudding, both packed with grains which didn’t leave much room for meat content. I once again preferred the flavour of the black pudding, which had a hint of cinnamon and cloves, which gave it a nice aromatic twist. Traditionally black pudding contains allspice, which is a single spice called pimenta reminiscent of a whole range of spices including cinnamon, nutmeg, pepper and cloves. The menu lists a potato cake in this dish but my plate came with fried baby potatoes. The fried egg was cooked perfectly with a runny yolk and a solitary tomato was roasted and seasoned nicely. The Clonanny Farm sausages weren’t memorable but they had that traditional local Irish butcher flavour and the small flat cap mushrooms added a subtle flavour. The brown soda bread was warm and crunchy, very satisfying with some creamy salted butter. Out of the three venues, I thought the food was lovely but somehow it didn’t leave a lasting impression. Moloughney’s is open every day for breakfast and lunch and from Tuesday to Sunday for dinner. 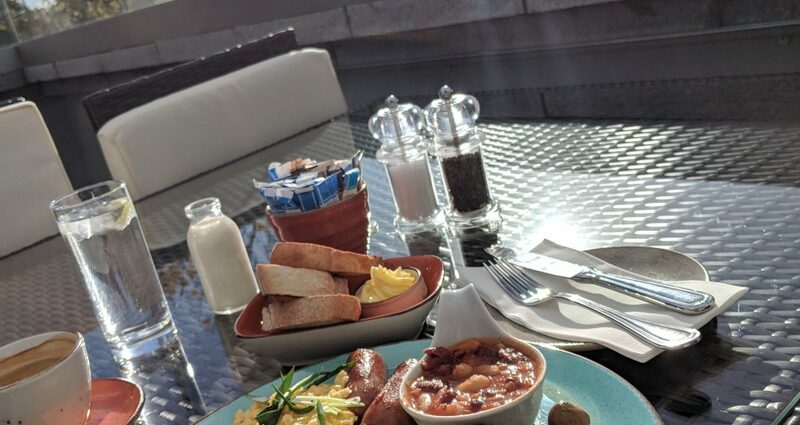 Pigeon House in Clontarf is a smart but relaxed brunch place and restaurant in Clontarf. Out of the three places I had breakfast in, this is the only one that charges slightly more at the weekend for pretty much the same brunch served during the week, with the only difference that on Saturdays and Sundays it’s called the Pigeon House Grill and has added fried potato. Same applies to other items on the breakfast menu like the buttermilk pancakes for example, which costs more at the weekend. The Pigeon House breakfast consists of two poached eggs cooked beautifully, a delicious sourdough toast (and I wish there were two slices of it! ), very tasty crispy bacon, two small flat cap mushrooms, one sausage, half a tomato and two slices of black pudding. I think there should really be at least a couple of tomatoes in a breakfast. Black pudding was the meatiest out of all three places I’ve been, with aromatic spices but very greasy, which on the one hand meant the outside was crispy and satisfying, but on the other the inside had some fairly chunky pieces of fat (the size of raisins). While there was no white pudding, the two slices of black pudding were very generous. Coffee was nice and strong and I ordered a second one, but I had to remind the staff that I was waiting for it after a while. I went during the week just after it opened at 10am and it got rather busy straight afterwards. The Pigeon House is open from Tuesday to Sunday for breakfast, lunch and dinner. For my own personal taste and overall experience, The Upper Deck at Yacht Bar was the clear winner. However, if you are a bread snob and are a fan of proper sourdough, you should definitely go to Pigeon House. I paid for all my meals. 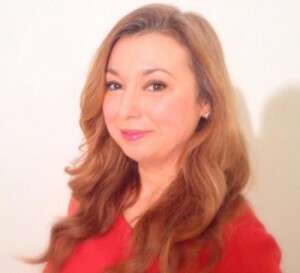 All pictures taken by me, Paola Bassanese.